2 The Fireside Poets The Fireside poets were a group of American poets who were the first to rival British poets in popularity. Their poetry was written in a more simple verse and meter so the regular, American person could read, understand and memorize without much difficulty. Their subject matter was also based on American life so their audience could better relate. 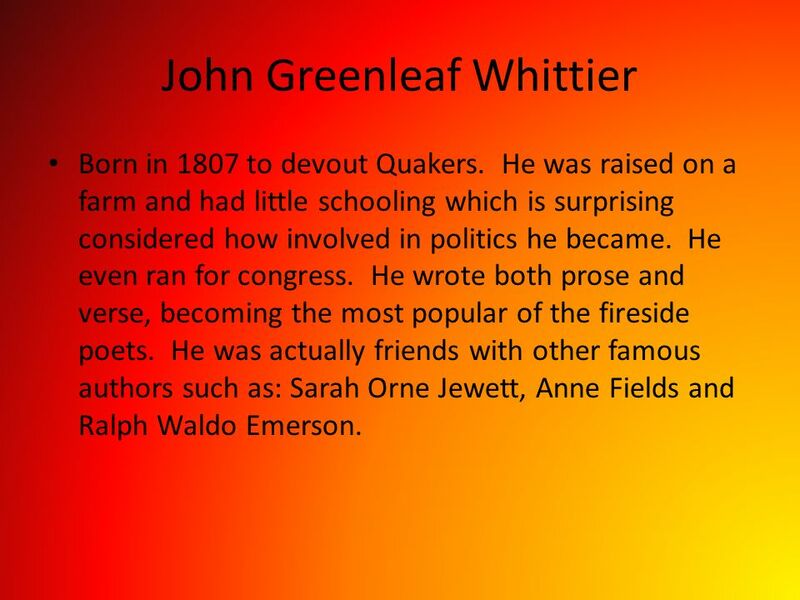 3 John Greenleaf Whittier Born in 1807 to devout Quakers. He was raised on a farm and had little schooling which is surprising considered how involved in politics he became. He even ran for congress. He wrote both prose and verse, becoming the most popular of the fireside poets. He was actually friends with other famous authors such as: Sarah Orne Jewett, Anne Fields and Ralph Waldo Emerson. 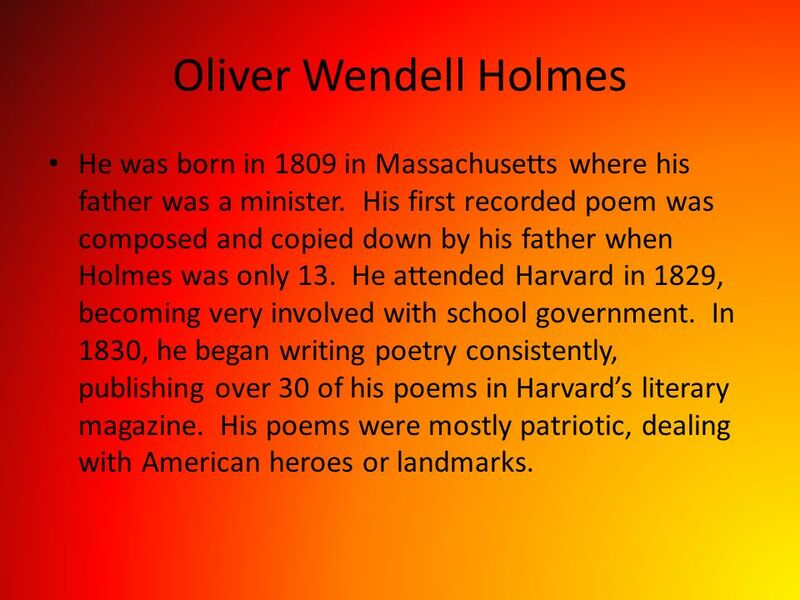 4 Oliver Wendell Holmes He was born in 1809 in Massachusetts where his father was a minister. His first recorded poem was composed and copied down by his father when Holmes was only 13. He attended Harvard in 1829, becoming very involved with school government. In 1830, he began writing poetry consistently, publishing over 30 of his poems in Harvard’s literary magazine. His poems were mostly patriotic, dealing with American heroes or landmarks. 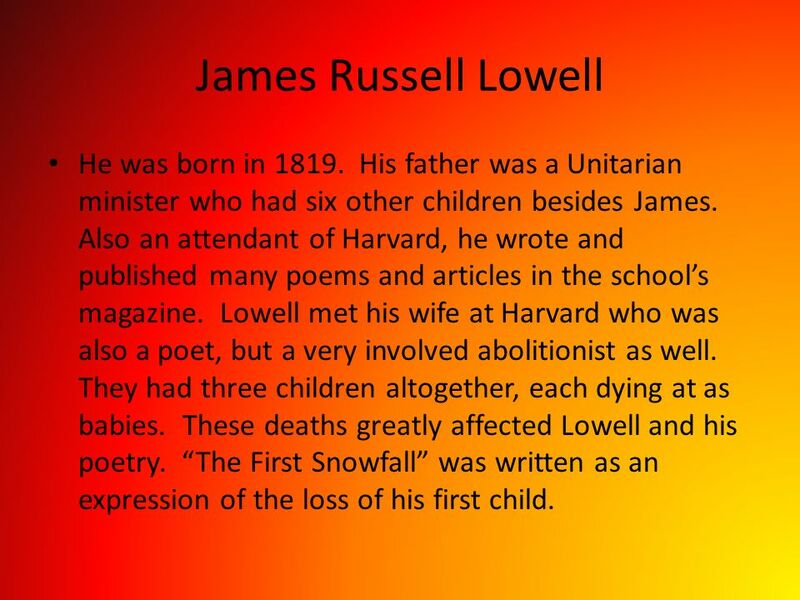 5 James Russell Lowell He was born in 1819. His father was a Unitarian minister who had six other children besides James. Also an attendant of Harvard, he wrote and published many poems and articles in the school’s magazine. Lowell met his wife at Harvard who was also a poet, but a very involved abolitionist as well. They had three children altogether, each dying at as babies. These deaths greatly affected Lowell and his poetry. “The First Snowfall” was written as an expression of the loss of his first child. 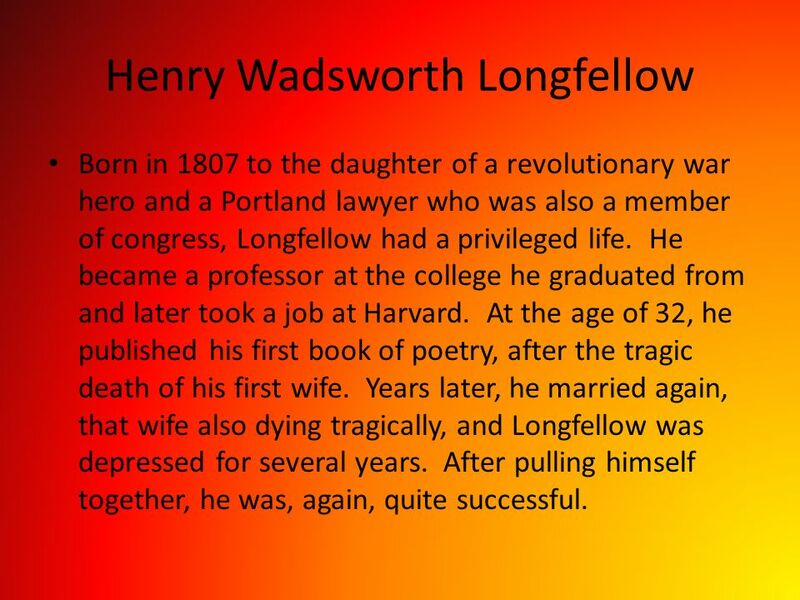 6 Henry Wadsworth Longfellow Born in 1807 to the daughter of a revolutionary war hero and a Portland lawyer who was also a member of congress, Longfellow had a privileged life. He became a professor at the college he graduated from and later took a job at Harvard. At the age of 32, he published his first book of poetry, after the tragic death of his first wife. Years later, he married again, that wife also dying tragically, and Longfellow was depressed for several years. After pulling himself together, he was, again, quite successful. 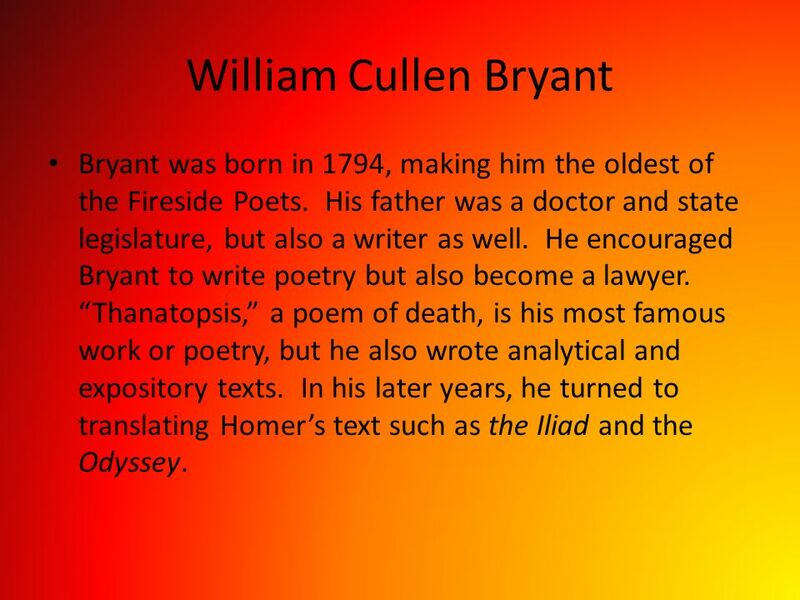 7 William Cullen Bryant Bryant was born in 1794, making him the oldest of the Fireside Poets. His father was a doctor and state legislature, but also a writer as well. He encouraged Bryant to write poetry but also become a lawyer. “Thanatopsis,” a poem of death, is his most famous work or poetry, but he also wrote analytical and expository texts. In his later years, he turned to translating Homer’s text such as the Iliad and the Odyssey. 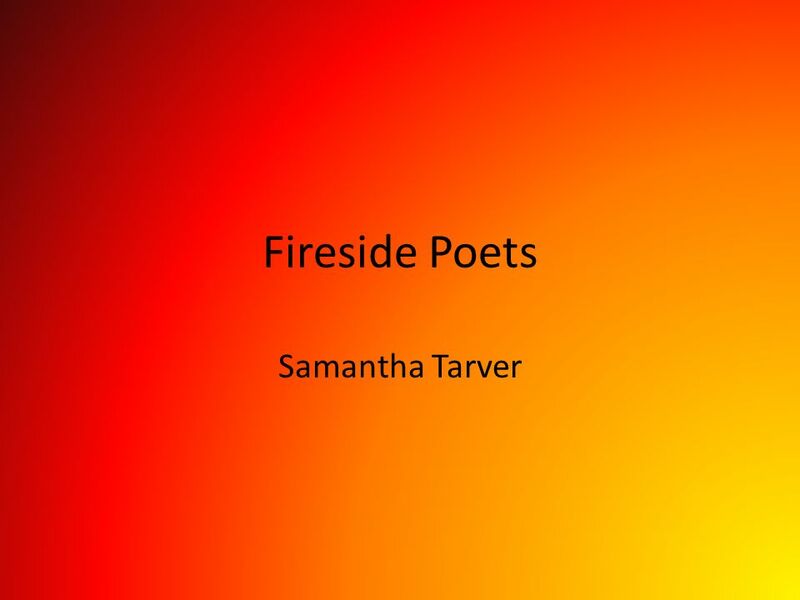 Download ppt "Fireside Poets Samantha Tarver. 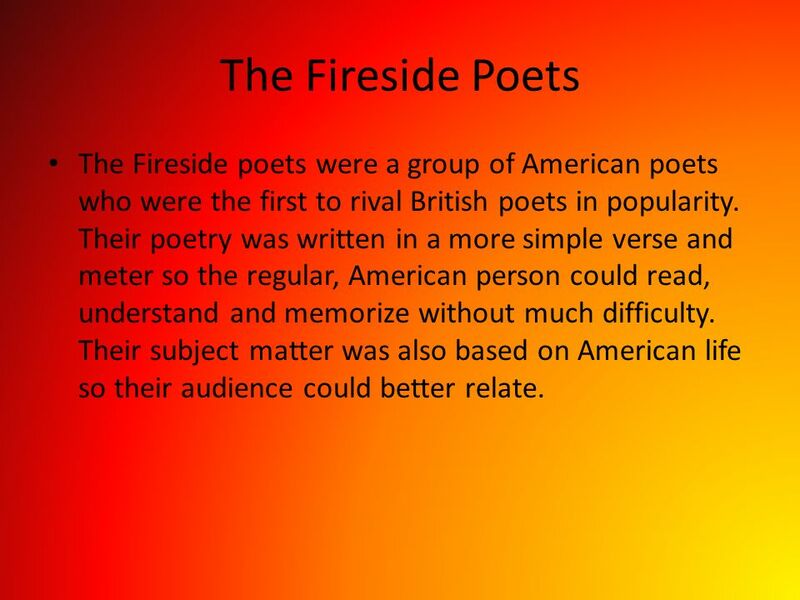 The Fireside Poets The Fireside poets were a group of American poets who were the first to rival British poets in popularity." An introduction to Ralph Waldo Emerson The Transcendentalists Mrs. Jimenez English III. Fireside Poets Longfellow, Whittier, Holmes, Lowell, Bryant.  16 east coast states  Louisiana Purchase brought about rapid growth of nation  Improved transportation from canals, turnpikes, railroads. The New England Renaissance ROMANTICISM A literary and artistic movement of the 18th and 19th centuries that placed value on emotion or imagination. THE PHILOSOPHY, AUTHORS & FAMOUS WORKS.  German Idealism a philosophical movement: emerged in the late 1700’s in Germany The belief that an item’s. Robert Frost The American Voice…. Background Born March 26, 1874 Grew up in San Francisco, California Favorite pass time as a child was playing baseball. The American Canon. 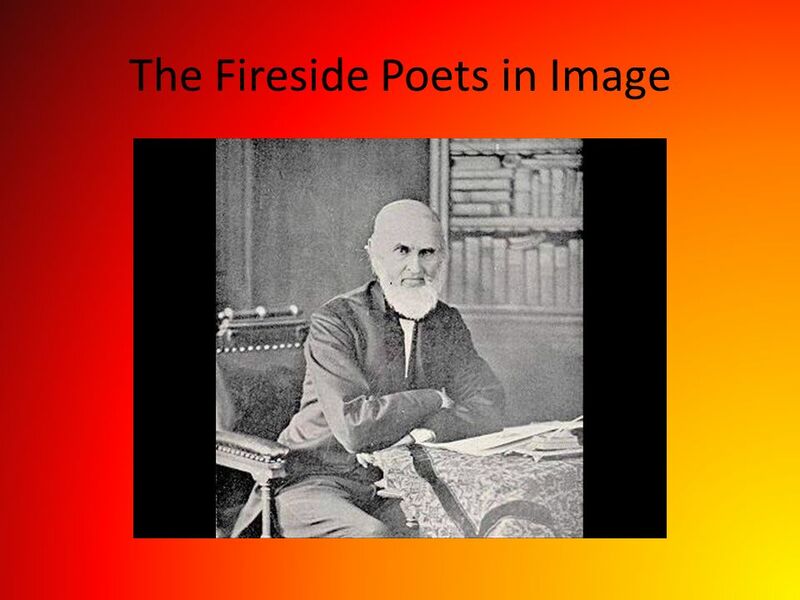 Fireside Poets The Fireside Poets include Henry Wadsworth Longfellow, Oliver Wendell Holmes, William Cullen Bryant, John Greenleaf. Henry Wadsworth Longfellow 主讲人： YangQian. Henry Wadsworth Longfellow ( ) The most popular American poet of the 19th century. Page  1 William Cullen Bryant 李乾中 Page  2 William Cullen Bryant BiographyContributionMasterworksThemeStyle Outline. AMERICAN ROMANTICISM.  Writers celebrated individualism, nature, imagination, creativity, and emotions  Interest in fantasy and supernatural. WILLIAM WADSWORTH. EARLY LIFE Second of 5 children Father (Law Agent and Rent Collector), Family Rich Mother died when Wadsworth was 8 Attended Hawkshead. Was an American Transcendentalist poet, philosopher and essayist during the 19th century was an American Transcendentalist poet, philosopher and essayist.